Congressman Peter King let loose on Eliot Spitzer today, warning that the governor of New York had left himself open to blackmail. It&apos;s a point we made here yesterday but it seems to be catching on. "Spitzer himself was very severe going after prostitution rings that had to do with white collar crimes. He was very hard-nosed with his tactics," King told David Freddoso of National Review. "To leave himself open to blackmail — putting himself and the state in a compromised position like that — it&apos;s just awful." King points out that prostitution rings are typically connected to organized crime, which makes the blackmail possibilities even more troubling. King adds that Spitzer will have to resign, and has some nice things to say about David Patterson, the lieutenant governor who would succeed Spitzer if he resigns. Update: Veteran Wall Street reporter Gary Weiss also stresses the blackmail angle. That&apos;s because the key word here is not "hypocrisy" or "morality," it&apos;s "blackmail." 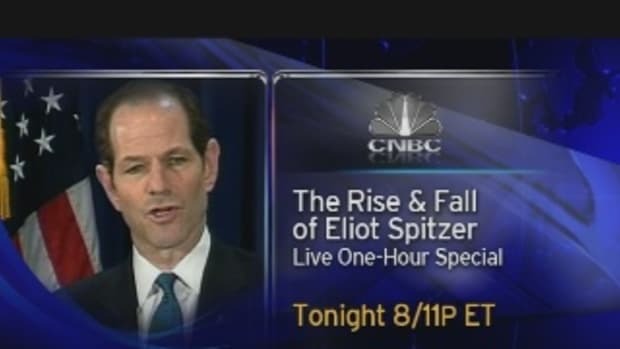 If Spitzer has been patronizing prostitutes, he&apos;d be leaving himself open to being shaken down, perhaps by the mob. The Russian mob is heavily involved in prostitution.